Calling all Art Lovers! If you fancy investing in some unique, affordable art (and possibly bagging yourself a genuine piece by someone famous), you need to get down to the Royal College of Art on 20th November. 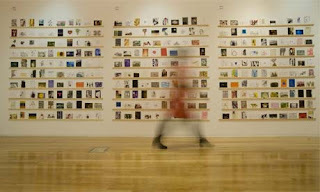 The RCA Secret is an annual exhibition of over 2,500 contemporary postcard-sized artworks for sale. All the pieces are created and donated by artists at the RCA, as well as various professional artists, designers and illustrators including well-known people which in previous years have included David Hockney, Banksy, Yoko Ono, Paul Smith, Mary Quant, Tracey Emin & Manolo Blahnik. The SECRET being that the artist's signature is hidden on the reverse - only to be revealed once the piece has been purchased. At £45 a pop, it's worth investing in one or two (4 max per person) just as something fun to brighten your wall. But if you discover you've unwittingly invested in a mini Banksy... hallelujah! Admission is free, but beware, the 'Secret' die-hards will be queuing around the block before sunrise, so you'll need to be quick. Note: you'll need to register in advance if you want to purchase any art. You can do this at the exhibition or online at the RCA website. If you can't make the viewing days, postcards can also be viewed online from 12th November. Once you've finished at the RCA, you may want to take the weight off your weary art-stalking feet and enjoy a drink at the nearby Gore Hotel which has a lovely wood-paneled bar serving perfect cocktails. 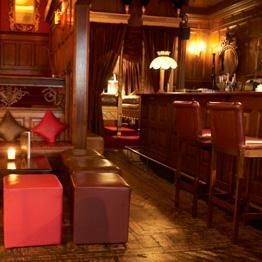 It even has a private 'carriage' room - an ideal hideaway to celebrate your artistic investment. If you're feeling peckish, you'll find great grub at the adjoining Bistro 190. Stay tuned for more Miss Immy blog spots coming very soon. Thanks for this - I think I would like to buy some art now pur-leeease - but not sure if I can tent out. Quite keen to visit this Gore Hotel.